Start a Christmas tradition with Christmas pajamas for the whole family! You can order your new personalized Christmas pajamas by adding a name or monogram. Choose from red and white candy striped Christmas Pajamas for kids or complete the look with red and green Christmas pajamas for adults! 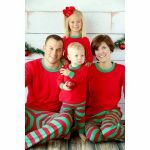 You'll have the cutest Christmas card pictures to send out with a photo of everyone in green and white monogrammed Christmas Pajamas for family!